This is the only guidebook to document Irish Climbing in a single volume. It focuses on the best routes at the best crags and includes areas and routes that have never been documented in a modern guidebook before. Very detailed directions and maps make it easy for the first time visitor to find and climb their chosen route. There are over 100 high quality photo topos in a clean, modern design and layout. 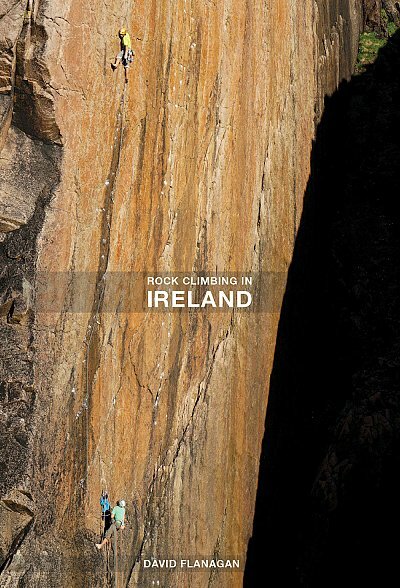 The action and landscape shots show Ireland and Irish climbing at their very best. This is a selective guidebook focussing on quality routes throughout the grades. There are 22 crag destinations, north and south, including Fair Head; Donegal; Dalkey Quarry; Wicklow; The Mournes; and The Burren. David Flanagan from Dublin, Ireland has been climbing for 20 years. Rock Climbing in Ireland is his third book. His first, Bouldering in Ireland, was a finalist in the Guidebook category of the 2011 Banff Mountain Book Competition and is now in its second edition. His second book, Bouldering Essentials is a how-to guide for beginner and intermediate boulderers and is a finalist in the Guidebook category of the 2013 Banff Mountain Book Competition.